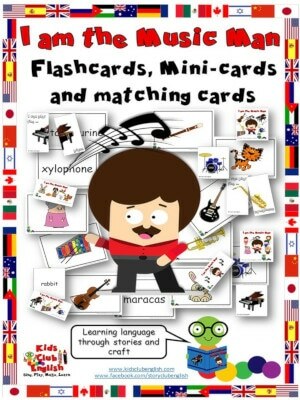 I am the Music Man flashcards and game card sets starring musical instruments, pets and people vocabulary that you can use in conjunction with the I am the Music Man song or story book OR as part of a unit on music, pets or people. Detailed Activity Suggestions are included with games you can play with the matching and mini-cards. A great resource to have ready for fast finishers too. Flashcards come in both A4 and A5 sizes and include image and word cards. Optional card backs are included for all card sets. Please note the I am the Music Man story book is not provided with this resource but is available in major book stores. See the preview for the SUGGESTED LANGUAGE FOCUS, to see the complete list of vocabulary items included in the resource. Visit the I am the Music Man Story Resource Page for more I am the Music Man videos, songs & crafts! Also available in our Teachers Pay Teachers Store. Kids Club English recommends you laminate flash / mini / matching cards for improved durability. Laminating materials are not included.